Leaving Paros in settled weather our passage to Milos (55Nm) was a comfortable ride. Knowing there would be a gale from southeast the following morning we opted for anchoring in the south bay (Rod Heikell: In strong winds from the south Adhamas port is a dangerous place due to the long fetch creating a dangerous swell in this large bay"). When passing Adhamas we saw a new breakwater had been built in the form of a "floating bridge", Subsequently we anchored stern to with 2 mooringlines in the bow. Next morning we had galewinds from SE as expected creating a large swell in the bay. Floatingbridge and all boats were moving heavily but we managed fine with anchor and 2 mooringlines in the bow together with 2 aftropes and springlines. In the afternoon the gale from SE was replaced by a gale from SW force 7-8 (36kts) howling the whole night. Today it´s calm but another gale from the north is coming in tonight. 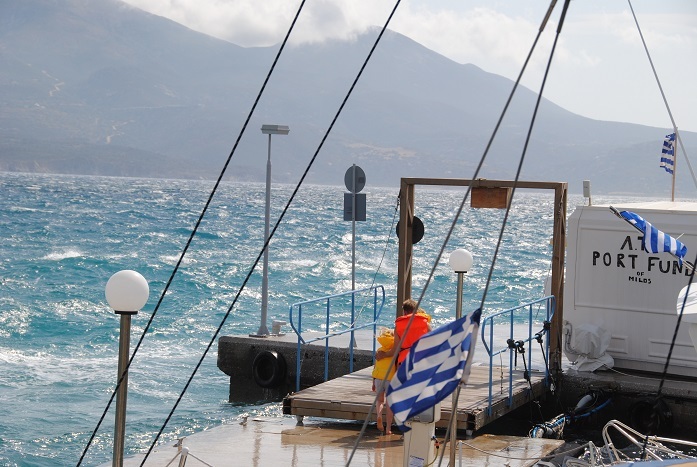 Our new crew Patrik is coming by ferry from Santorini today (weather permitting). The Australian children on the picture are waiting for their father to pass over to the pier since the floatingbridge is moving to much for a safe passage.